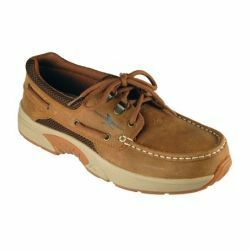 The Rugged Shark Atlantic was originally designed as a boating shoe, then the Atlantic was quickly recognized as one of the most comfortable shoes ever made! That's why it has been in the Rugged Shark line for over eight years. The Atlantic is an oxford style 3-Eyelet Boat Shoe with leather uppers, a Lycra neoprene padded collar, comfort footbed and a slip resistant rubber outsole. Put them on and you might never take them off.